A “dream home” looks different for everyone. For some, it includes an ultra-modern façade and minimalist interior design. For others, the ideal home would seamlessly blend the indoors and outdoors with open living spaces designed for entertaining. No matter what your idea of a perfect abode is, working with a custom home builder can help your vision come to life. Ensuring the results you’ve dreamt of doesn’t have to be daunting. Our team of architects and designers has worked on countless custom home projects, learning the ins and outs of working with clients to achieve their ultimate home goals. The following are the top tips we have to share to forge a strong partnership with a luxury modern home builder and create your one-of-a-kind living space. 1. Quality qualifications and references matter. You deserve to work with a firm that truly understands your wants and needs. Throughout your design/build process, you should feel confident that what is designed is what will be built. 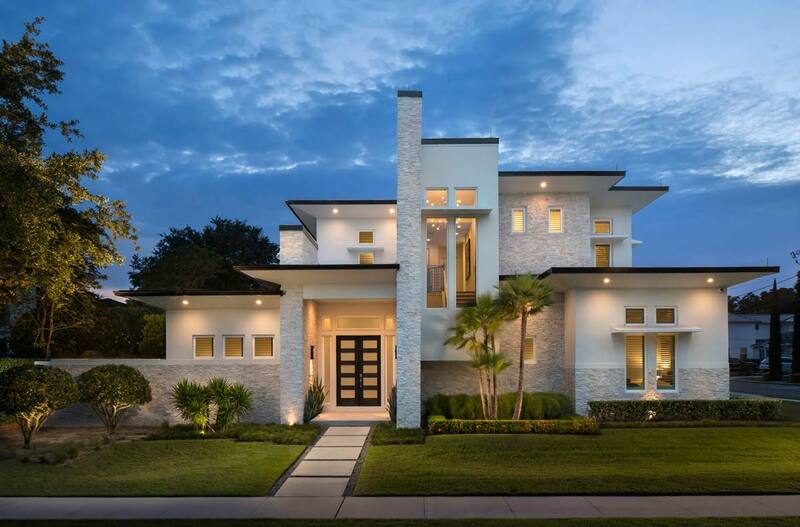 To ensure a smooth, communicative process, you’ll want to work with a custom home builder that has impeccable qualifications, a portfolio of existing luxury custom homes that makes your heart beat faster, and a substantial list of recent references. Look for architects and firms, like Phil Kean and Phil Kean Design Group (PKDG), that have a worldwide reputation for excellence and caring personal service that keeps each client at the center of the process start to finish. 2. Set the tone for your project with a thorough consultation. As with most large-scale projects, communication is key to results you’ll love. When working with a custom home builder, you want to feel like yours is the only project their attention is focused on. A personal, face-to-face meeting can give you that peace of mind and a glimpse into what your relationship with the architect and designers will be like. 3. Schedule frequent checkpoints throughout the design process. 4. Look for a flexible and accountable team you can trust. Working with a design/build firm like PKDG means you continue working with a team you know and trust for the best in modern home construction. There’s no handing your design off to another firm to build. You’ll be introduced to your own PKDG construction manager and selections coordinator and enjoy the confidence of weekly meetings. To ensure your total satisfaction, PKDG encourages design changes throughout the design and build process. 5. Integrate interior design into the design and construction phases. Your dream home should be cohesive, freely flowing from the outside in and from room to room. Interior design plays a key role in accomplishing this, which is why it should be strongly considered during the design and construction phases. At PKDG, our internationally renowned PKDG Interiors firm is interwoven throughout the design and building processes, resulting in spaces that are quite spectacularly “you.” Our signature PKDG interiors include sustainability, integrating natural materials, utilizing the latest technologies and seamless transitions between indoor and outdoor living spaces. “We work all kinds of interior design details into the process, it’s all about how clients see themselves living in the home,’ says Rob Turner, President of PKDG Interior Design.